Have you seen Still Alice? As you know it’s the story of a woman facing early onset Alzheimer’s. As I watched the movie recently, I was struck by the realization the human memory and the memories that we make throughout our lifetime are incredible gifts. The mind is a remarkable thing. Our mind processes 34 gigabytes of content and 100,000 words of information in one day. You might compare this to Leo Tolstoy’s “War and Peace” which is only 460,000 words long. This means 100,000 words cross our eyes and ears in a single 24-hour period through TV, radio, the Web, text messages, video games and other stuff. Incredible wouldn’t you say? Out of all of this information we take in and process, just think about the memories you make, those that really make a mark on us. In the movie, Alice lost her sweet memories; of precious family, a successful career, and life adventures. She fought the disease that was stealing who she was, the life she had created. As I reflect on some of my most precious memories. I think of my sweet Mimi, my great grandmother, a retired school teacher who I thought was Julia Child incarnate. After school my grandmother Pat would pick me up and we would be off to Mimi’s house for an after school snack and conversation. Many times she’d serve freshly picked pecans that I would lick, then dip into the sugar bowl and pop into my mouth. Boy were those the best! I guess Mimi didn’t mind that I double dipped into her sugar bowl, as she never mentioned it. Many times after school, Mimi and I would play ‘school’. She was my student and I would teach her school lessons. Mimi played right along and she never tired of my teaching. She was attentive. She was present. Always engaged. Just she and I. I never doubted that Mimi loved me. Some days I’d walk into Mimi’s house after school and smell cinnamon wafting down the hall, drawing me to the kitchen. Mimi was making her melt-in-your-mouth Snickerdoodle cookies. 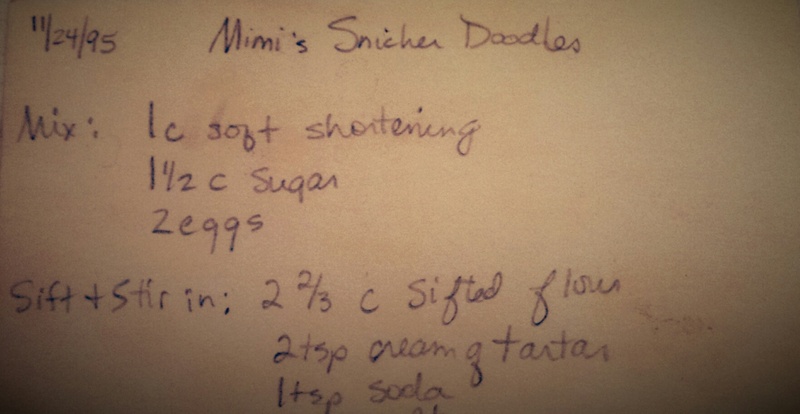 I still have the recipe card that I transcribed that day from Mimi. “The best portion of our lives will be the small, nameless moments we spend smiling with someone who matters to us.”–Someone who is much more articulate than me said this. Mimi’s recipe. A sweet bake. Chill & roll in small balls. Coat in 2tsp cinnamon & 2 tsp sugar. Bake at 400. Tracy, the Blog is great! Keep it up.. nice job girl! Still Alice was such a great story! Read the book then watched the movie. I had my husband read the book and watch the movie with me. It was so good I needed someone to talk to about it. What great memories you had with your grandmother! Thanks for sharing! Thank you Denay! So glad you stopped by. Both ladies were pretty special! Hope you have a great Easter & try the cookies! Love your blog too by the way.